Step 1 In a teapot combine mint leaves, sugar, and tea and add boiling water. Let tea steep 5 to 10 minutes. Moroccan mint tea with special equipment : a 1- to 1 1/2-quart teapot. 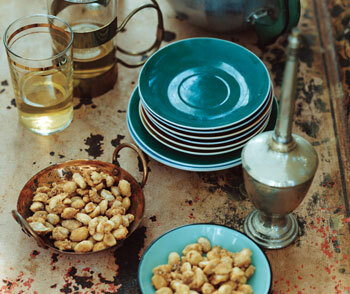 To make this moroccan mint tea for 6 persons you will need 10 min for preaparation and 10 min for baking. Step 1 Put tea in teapot and pour in 1 cup boiling water, then swirl gently to warm pot and rinse tea. Strain out and discard water, reserving tea leaves in pot. Step 2 Add remaining 4 cups boiling water to tea and let steep 2 minutes. Stir in sugar (to taste) and mint sprigs and steep 3 to 4 minutes more.